Riding on the success of OCTB <反黑>, director Jones Chong (宋本中) announced that the screenplay for the second season is finally completed, and filming will start soon. The first season of the web drama aired to critical success, and its streaming on Netflix increased OCTB‘s international profile. 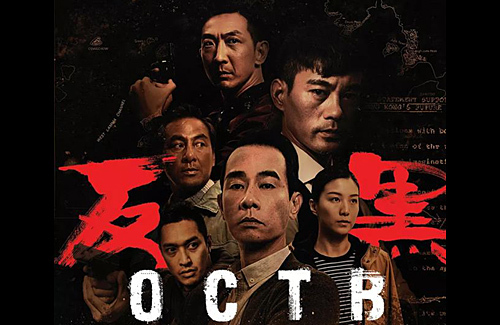 Starring Jordan Chan (陳小春) and Justin Cheung (張建聲), the story revolves around an undercover detective who makes dangerous enemies with triad leaders whom he had double crossed. Although he didn’t reveal a solid release date, Director Chong confirmed that they have finished tidying up the screenplay and will head into filming earlier than scheduled. While the first season only took three months to film and only contained 30 episodes, it’s speculated that the second season will total 60 episodes and will film in London, England as well. On whether or not the new production will retain its original casting consisting of Jordan Chan, Danny Chan (陳國坤), and Sam Lee (李璨琛), the director expressed that there were some initial concerns with securing the actors due to their busy schedules, but everything is currently going well. When asked if perhaps he could invite Roy Chan (張耀揚), who is known for his villainous roles in the past, to join the OCTB 2 cast, Director Chong laughed and admitted that it would be rather difficult in this case. However, he will try his best to satisfy viewers and hope that OCTB 2 will achieve a similar level of success. Looking forward to OCTB season 2. I thought they had it wrapped up already. Too bad! @anon No, Jones had been working on modifying the script for ages and they only started filming recently. Btw, this article isn’t accurately translated. The Chinese version said that there actually will be foreign actors in the cast (I’m assuming Western actors, though may or may not be from Hollywood), which is why they will be filming on location in England as well as Australia (to accommodate the filming schedules of those actors). I’m looking forward to season 2! With a bigger budget and the international profile now partnering with Netflix, the expectations are high so season 2 better not disappoint (especially since Netflix raised their subscription fees recently — need to get our bang for our buck, lol).